In September 2015, Madrid — the capital of Spain — initiated a participatory democracy project, Decide Madrid (Madrid decides), to enable participatory strategic planning for the municipality. 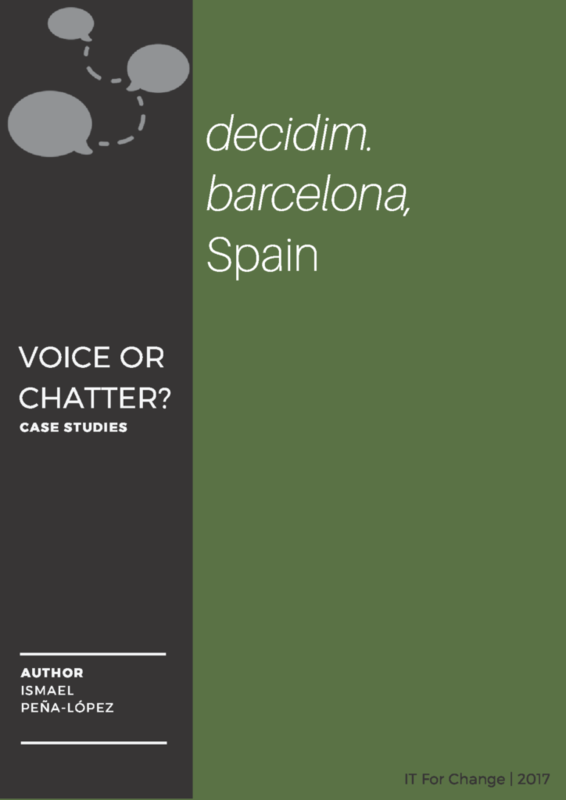 Less than half a year after, in February 2016, Barcelona — the second largest city in Spain and capital of Catalonia — issued their own participatory democracy project: decidim.barcelona (Barcelona we decide). 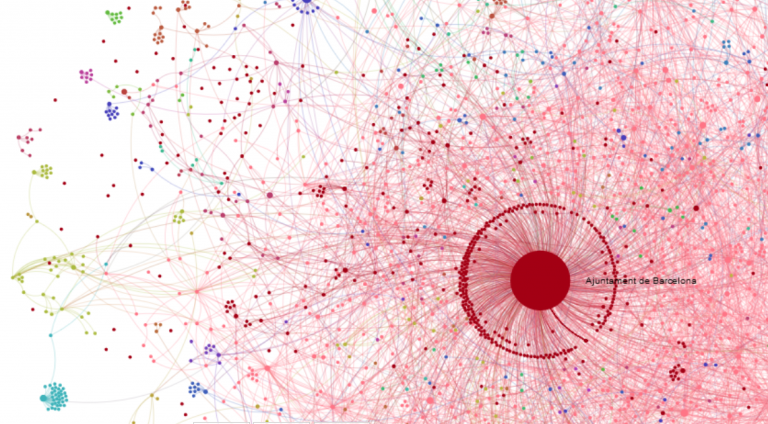 Both cities use the same free software platform as a base, and are guided by the same political vision. The success of the initiatives and the strong political vision behind them have caused an outburst of other initiatives around the whole state – and most especially in Catalonia – that are working to emulate the two big cities. They are sharing their free-software-based technology, their procedures and protocols, their reflections both on open events as in formal official meetings. What began as seemingly a one-time project, has spread both in length and width. In length, because it will not only stay but grow over time. 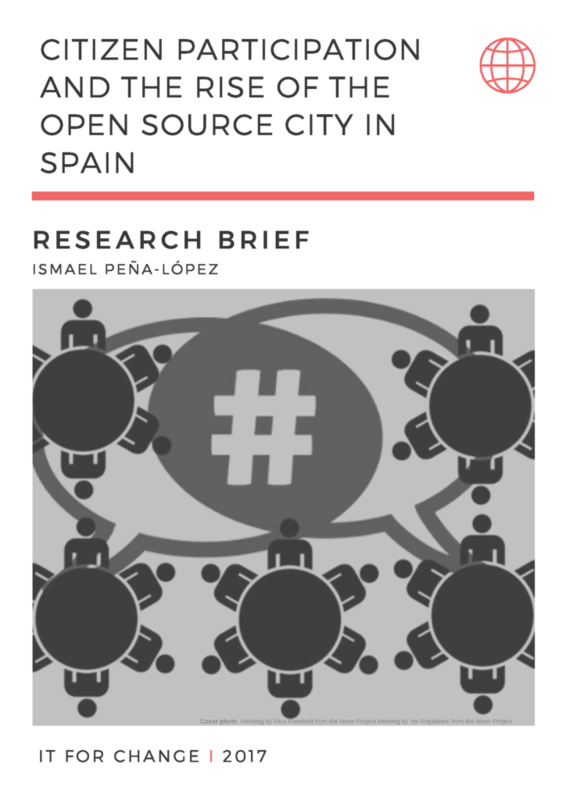 In width, because there are serious plans to expand its adoption both at the regional level, led by the Barcelona County Council, and at the Spanish State level, being replicated by other municipalities. 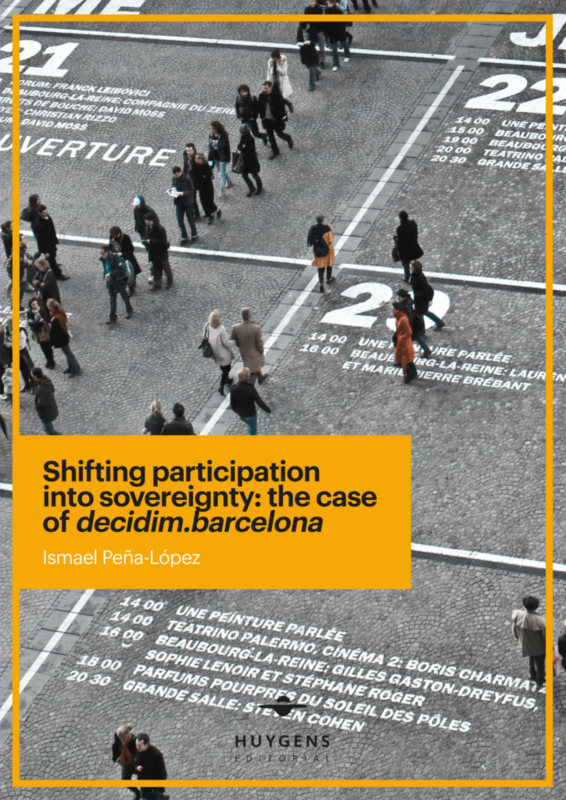 Of course, the big question is whether this has had any positive impact in the quality of democracy, the very intention behind the participatory initiative in Barcelona. Available open documentation suggests that decidim.barcelona has increased the information access of the citizens, has gathered more citizens around key issues. There has been an increase of participation, with citizen created proposals that have been widely supported and legitimated and finally accepted to be part of the municipality strategic plan. As pluralism has been enhanced without damaging the existing social capital, we can only think that the increase of participation has led to an improvement of democratic processes, especially in bolstering legitimacy around decision making. Deliberation becomes the new democracy standard. Openness as the pre-requisite for deliberation. Accountability and legislative footprint as an important by-product to achieve legitimacy. Although the scheme may be simple, we believe that it already features most of the components of a new democratic participation in the digital age. What remains to be measured and analyzed is the strength and stability of the new relationships of power and how exactly these will challenge the preceding systemic structures and lead to newer ones. Although some aspects have been identified in what relates to new relationships between citizens and organizations and institutions, and in what relates to the creation of new tacit communities, para-organizations relational spaces, the real trend and hypothetical final scenario will only become clear after several iterations of the same project evolve in a continuum of participation, radically different from existing, discrete participatory structures. What has already been measured is the impact both at the quantitative level and on the culture of the organization of the City Council. The culture of participation was scarce and mainly dealt with managing the support of the citizen in top-down type initiatives. Changing the mindset implied turning upside-down, many of the departments and processes of the City Council: new coordination structures, new balances between the central administration and the districts’, need to speed up the slow tempos of the Administration, manage public-private partnerships (that had to be coordinated too), enable private-private coordination and, in general, increase the workload. Although the platform and the project in general changed the way of working, and changed it for good by contributing to visualize the work of the public servants, one of the main conclusions reinforces the old saying — democracy is not cheap. 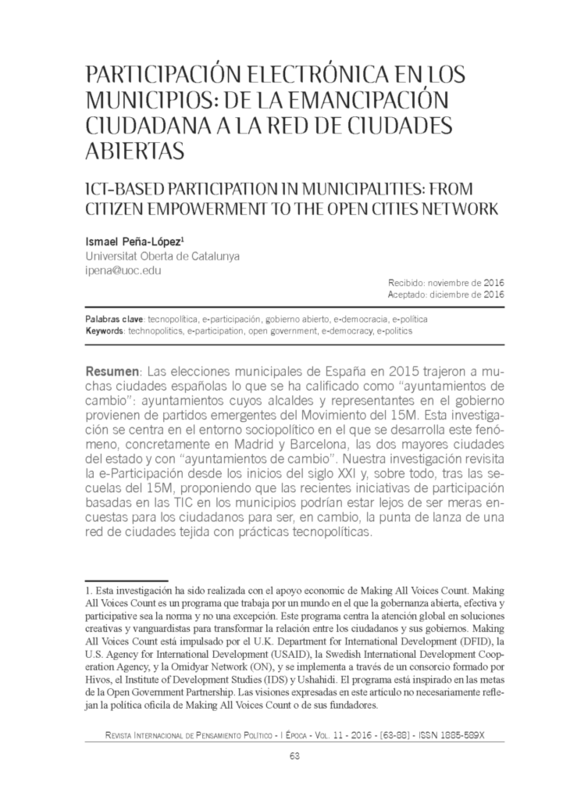 Originally published on March 3, 2017, as Participation in Spanish Municipalities: The Makings of a Network of Open cities at the blog of the research project Voice or Chatter? led by IT for Change. This research is part of the Voice or Chatter? Using Structuration Framework Towards a Theory of ICT Mediated Citizen Engagement research project led by IT for Change and carried on under the Making All Voices Count programme. The research began in May 2016 and is about to end by January 2017. The project consists in analysing several cases of ICT mediated citizen engagement in the world, led by governments with the aim to increase participation in policy affairs. This subproject deals with the case of decidim.Barcelona, an ambitious project by the City Council of Barcelona (Spain) to increase engagement in the design, monitoring and assessment of its strategic plan for 2016-2019. These specific pages focus on the socio-political environment where this subproject takes place, specifically speaking Barcelona, Catalonia and Spain, for the geographical coordinates, and for the temporal coordinates the beginnings of the XXIst century and most especially the aftermath of the May 15, 2011 Spanish Indignados Movement or 15M – with some needed flashbacks to the restauration of Democracy in 1975-1978. 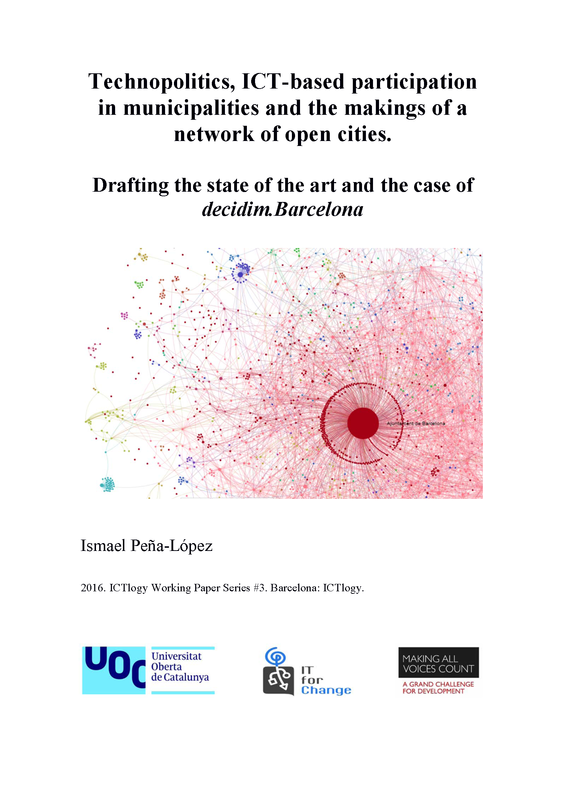 The working paper Technopolitics, ICT-based participation in municipalities and the makings of a network of open cities. Drafting the state of the art and the case of decidim.Barcelona , thus, aims at explaining how and why such an ICT-based participation project like decidim.Barcelona could take place in Barcelona in the first months 2016, although it will, of course, relate to the project itself every now and then.